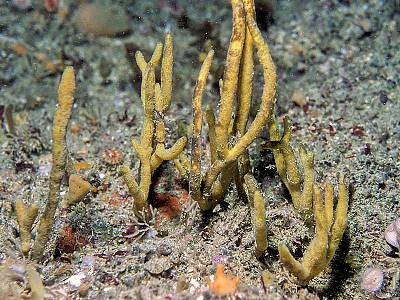 Description: This is a tough, wiry sponge consisting of a group of pointed cylidrical branches attached at the base. The branches may coalesce and take on an antler-like appearance. The surface is smooth, without projecting spicules and the oscules are tiny and inconspicuous. It is yellow in colour with brown patches. There are striations on the surface which are visible in collected specimens. 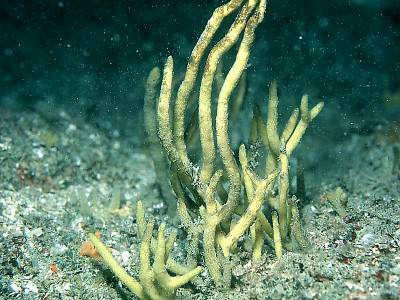 Habitat: Attached to rock which is covered at least periodically with coarse sand or gravel. Usually in areas subject to strong tidal streams. Distribution: A southern species in the British Isles, most records are from the western English Channel. 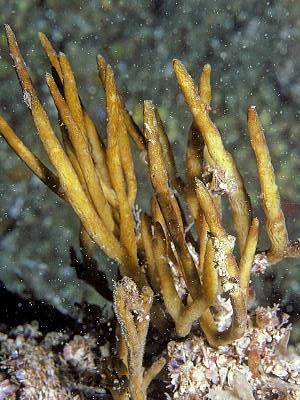 Similar Species: Compare with Stelligera stuposa which is softer in consistency and has a hairy surface due to long emergent spicules. Picton, B.E. & Morrow, C.C. (2016). Adreus fascicularis (Bowerbank, 1866). [In] Encyclopedia of Marine Life of Britain and Ireland.